A facebook friend posted the picture reproduced above-- it makes the case that President Obama has been a successful creator of jobs, and also paints GW Bush as a president who lost jobs. Another friend pointed out that to be fair, all of Bush's presidency ought to be included. Let's make a fair plot of job growth and loss. Data can be retrieved from the Bureau of Labor Statistics, where Nick will be spending his next sabbatical. The extract we use below is also available from the book website. This particular table reports the cumulative change over the past three months, adjusting for seasonal trends. This tends to smooth out the line. The first job is to get the data into SAS. Here we demonstrate reading it directly from a URL, as outlined in section 1.1.6. The raw data are in a pretty inconvenient format for plotting. To make a long, narrow data set with a row for each month, we'll use proc transpose (section 1.5.3) to flip each year on its side. Then, to attach a date to each measure, we'll use the compress function. First we add "01" (the first of the month) to the month name, which is in a variable created by proc transpose with the default name "_name_". Then we tack on the year variable, and input the string in the date format. The resulting variable is a SAS date (number of days since 12/31/1959, see section 1.6.1). Now the data are ready to plot. It would probably be possible to use proc sgplot but proc gplot is more flexible and allows better control for presentation graphics. reflabel = (h=1.5 "Truman" "Eisenhower" "Kennedy/Johnson"
Much of the syntax above has been demonstrated in our book examples and blog entries. What may be unfamiliar is the use of the href option in the plot statement and the reflabel option in the axis statement. The former draws reference lines at the listed values in the plot, while the latter adds titles to these lines. The resulting plot is shown here. 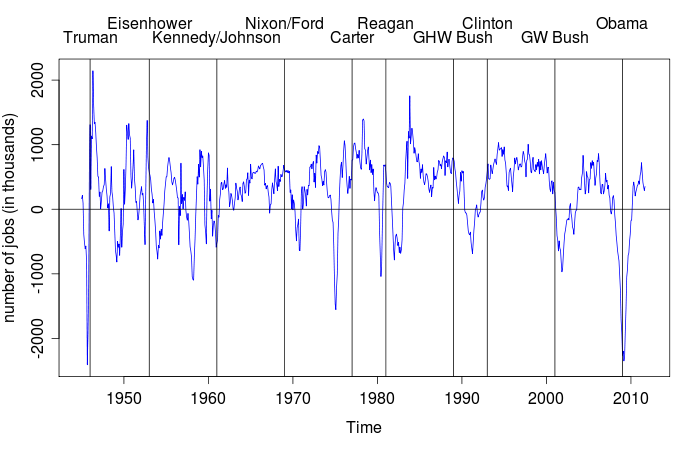 Looking fairly across postwar presidencies, only the Kennedy/Johnson and Clinton years were mostly unmarred by periods with large losses in jobs. The Carter years were also times jobs were consistently added. While the graphic shared on facebook overstates the case against GW Bush, it fairly shows Obama as a job creator thus far, to the extent a president can be credited with jobs created on his watch. The main trick in R is loading the data and getting it into the correct format. here we use cbind() to grab the appropriate columns, then transpose that matrix and turn it into a vector which serves as input for making a time series object with the ts() command (as in section 4.2.8). 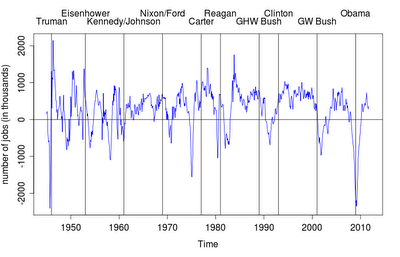 Once this is created, the default plot for a time series object is close to what we have in mind. All that remains is to add the reference lines for 0 jobs and the presidencies. The lines are most easily added with the abline() function (section 5.2.1). Easier than adding labels for the lines within the plot function will be to use the mtext() function to place the labels in the margins. We'll write a little function to save a few keystrokes by plotting the line and adding the label together. It might be worthwhile to standardize the number of jobs to the population size, since the dramatic loss of jobs due to demobilization after the Second World War during a single month in 1945 (2.4 million) represented 1.7% of the population, while the recent loss of 2.3 million jobs in 2009 represented only 0.8% of the population. Increasing employment is not an achievement if it is obtained using methods that will cause problems in the long-term, and that has been how much of the increases have been achieved. Basically increases in debt, either public or private, provide a stimulus to the economy. Unfortunately, if you keep doing that, you end up with massive levels of debt, and an economy that stalls because there is no good reason for new borrowings. So Clinton was lucky, his presidency covered the dot com boom, and he managed to leave about when it was ending. George W. Bush had the collapse at the end of the dot com, but the real estate bubble fixed everything up. 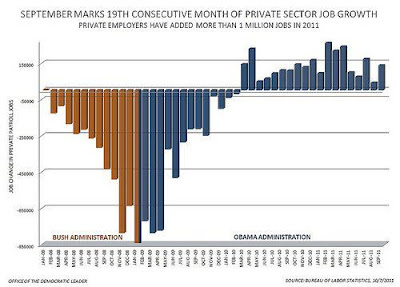 If it had broken a year later, Obama would have had most of the jobs disappearing under his presidency. Now he has the public debt bubble, which will continue until investors start dumping the US dollar, causing its value to decrease, and effectively reducing debt in real terms. Then someone will have to work out how to fix the problems in ways that don't involve debt creation. That's the point. Borrowing money from other countries to "create" job is not achievement at all. If the measure of unemployment has changed over time and BLS has not adjusted or normalized their data set then unemployment during the Eisenhower period is not necessarily equivalent to unemployment numbers reported during and after the Clinton administration (where I believe some significant "adjustments" occurred). Nice informative post,If the measure of unemployment has changed over time and BLS has not adjusted or normalized their data set.Thanks..